Greenacres Art Center is an absolute dream of an event venue. With stone walls, lush grounds, and unique architectural elements, Greenacres' ability to recast itself through florals, linens, lighting and design always delights. For the wedding ceremony we created a floral arch woven with eucalyptus, rose, peony and hydrangea that stood in front of a shallow, stone pool. The bride carried a hand tied, pale white and blush bouquet with smooth, rounded barely opened peony, white and pink roses and silvery dusty miller. Bridesmaids wore navy and carried smaller bouquets with bright pops of magenta and brilliant white hydrangea. Magenta, blush, vibrant green and brilliant white carried through to the reception. 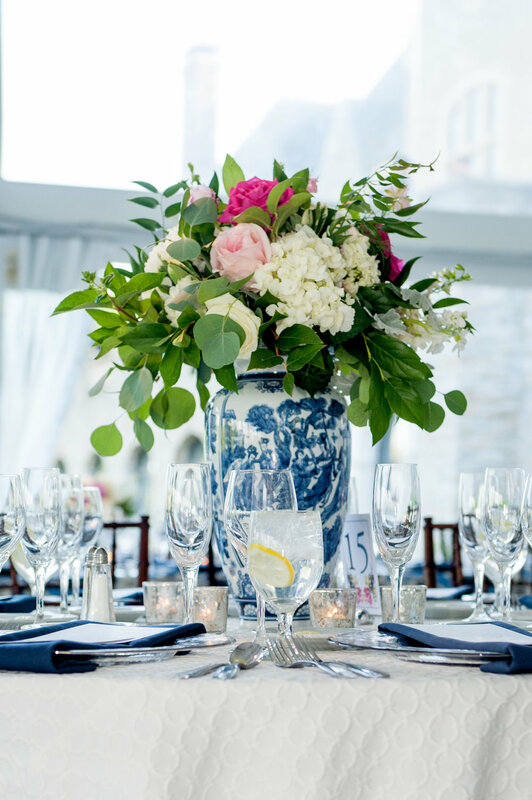 Table arrangements were a harmonious mix of the floral palette in a variety of clear glass vessels, silver vases and delftware inspired blue and white pottery. White paper lanterns hung from the open tent hovering above tables covered with white table cloths and blue monochromatic ikat linens. Keeping blue out of the florals allowed both the pottery and fabric designs to play a larger role in the overall design. The white of the florals bridged the gap between the decor and the flowers. The blue patterns added a light, watery and relaxing mood to the evening and were a perfect artistic compliment to the robust peony, rose and hydrangea.